On the Solemnity of the Most Sacred Heart of Jesus, which fell on June 19 this year, Pope Benedict XVI inaugurated the Year for Priests during a Vespers liturgy in St. Peter’s Basilica in Rome. The Holy Father has asked Catholics around the world to pray for the sanctification of priests during this special year, which is the 150th anniversary of the death of St. John Vianney, the patron saint of parish priests. Included among them are St. John the Apostle Parish in Bloomington, Our Lady of the Most Holy Rosary Parish in Indianapolis, St. Joseph Parish and St. Anne Parish, both in Jennings County, and St. John the Baptist Parish in Osgood. Father Michael Fritsch, pastor, and members of St. John the Apostle Parish in Bloomington began the year with a feast day Mass on June 19. One of the ways that the Holy Father is encouraging lay Catholics to pray for priests is by offering them partial indulgences throughout the year if they pray an Our Father, Hail Mary and Glory Be five times for a priest. On special days throughout the year, plenary indulgences will be offered. Depending on the kind of indulgence, it can be a remission of part of that temporal punishment (a partial indulgence) or all of it (a plenary indulgence). An indulgence is obtained when a Catholic fulfills the conditions set forth for them by proper Church authorities. Indulgences obtained by the faithful can be applied to them or to the dead still in the process of being purified in Purgatory. For more information on indulgences, read paragraphs #1471-#1479 of the Catechism of the Catholic Church. Parishes in the archdiocese that are observing the Year for Priests are putting lists of priests in their weekly bulletin and inviting parishioners to pray for those priests in the week to come. 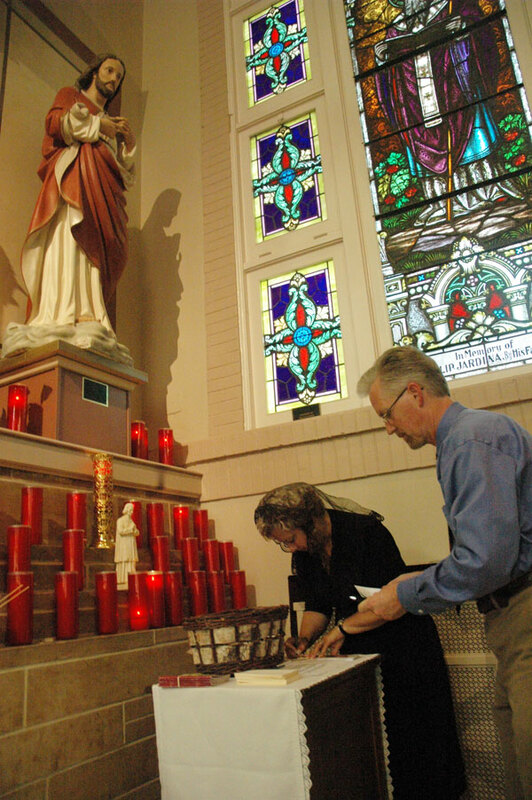 At Holy Rosary Parish, worshippers are encouraged to put the names of priests they would like remembered in prayer at Masses during the coming year in a basket placed in front of a statue of the Sacred Heart of Jesus in the parish’s church. In front of the statue is a special candle that will remain lit during the entire year and a smaller statue of St. John Vianney. Along with several of her fellow parishioners, Lorraine Rodts, a member of St. John the Apostle Parish, has been praying for priests for some time. She is excited about the Year for Priests, and the impact it can have on all the faithful. Transitional Deacon Sean Danda spoke about the relevance of the Year for Priests for those not in holy orders during a homily he delivered at a special feast day Mass on June 19 at Holy Rosary Church. “This Year of the Priest is meant to reawaken in our hearts a reminder of the fatherly love of each one of our pastors, of each priest that we encounter, of every young man preparing for the priesthood,” he said. “Without them, we would be like sheep without a shepherd. And we can get very used to wandering away on our own. In comments made before the June 19 Mass, Deacon Danda, previously a member of St. Malachy Parish in Brownsburg spoke about the importance of the laity’s prayers for him over the eight years of his priestly formation. Just eight days after he preached at the Mass at Holy Rosary Church, Deacon Danda was ordained a priest by Archbishop Daniel M. Buechlein. Msgr. Joseph F. Schaedel, vicar general and pastor of Holy Rosary Parish, was the celebrant at the Mass at his parish, which began its observance of the Year for Priests. “A priest is always touched when someone asks us to pray for them and for their intentions,” he said. “It tells a priest that folks know that—as the archbishop has always said—our first duty is to pray.